The Ghost Squad – an elite team of international undercover operators whose job it is to infiltrate themselves into situations that are either too sensitive or too hazardous for normal government operatives to undertake. 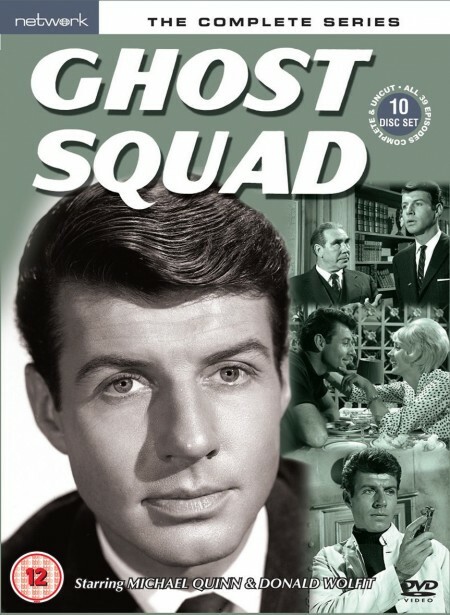 Not seen since the 1960s, Ghost Squad is much sought-after by ITC aficionados and fans of action-based television the world over. Starring Michael Quinn and Neil Hallett as Ghost Squad operatives Nick Craig and Tony Miller, every fifty-minute episode contains mystery, espionage, daring antics and the quirky humour much-loved by fans of other ITC shows such as The Saint, The Persuaders! and Danger Man. Featuring performances from many high calibre guest stars (such as Alfred Burke, William Hartnell, Honor Blackman, Warren Mitchell and Anton Diffring), the stories are tightly plotted by writers such as Tony O’Grady (aka Brian Clemens – The Avengers, The Professionals), Robert Holmes (Doctor Who), Leon Griffiths (Minder), Philip Levene (The Avengers), Louis Marks (Doomwatch) and Reed de Rouen (Man in a Suitcase). Amongst the directors are feature-film directors Don Sharp (Callan, The Thirty-Nine Steps) and Peter Sasdy (Countess Dracula, Hands of the Ripper).